LAFAYETTE, Ind. — The ‘Round the Fountain Art Fair, now in its 36th year, has brought high quality fine art to the Greater Lafayette community every year since 1973. The juried fair of 89 artists represents a number of media categories like watercolor, oil/acrylic, ceramic, sculpture, mixed media, wood and more. 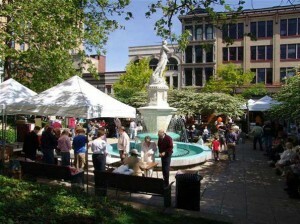 This year’s ‘Round the Fountain Art Fair is slated for Saturday, May 23rd (rain or shine), from 9:00a until 4:30p in Downtown Lafayette. Local, regional and national artists participate in what is considered by many to be one of the finest art fair in the Midwest. The RTFAF Committee also has a permanent collection, purchased from participating artists, of 2 dimensional art that is exhibited in the Tippecanoe County Courthouse for the enjoyment of the community.